. índice . Prefacio . Preface . . aguas . 1 . 2 . 3 . 4 . 5 . 6 . . contamina 1 . 2 . 3 . 4 . 5 . 6 . . holocausto 1 . 2 . 3 . 4 . 5 . 6 . 7 . 8 . 9 . 10 . 11 . 12 . 13 . . lineas 1 . 2 . 3 . 4 . . hidrotermias 1 . 2 . 3 . 4 . 5 . 6 . . nuevas 1 . 2 . 3 . . Reconquista 1 . 2 . . hidrogeo 1 . 2 . 3 . 4 . 5 . 6 . . esbozos 1 . 2 . 3 . 4 . 5 . 6 . 7 . 8 . . corredorcentral 1 . 2 . 3 . 4 . 5 . 6 . . cordones 1 . 2 . 3 . 4 . 5 . . epiola 1 . 2 . 3 . 4 . 5 . 6 . . deriva 1 . 2 . 3 . 4 . 5 . 6 . 7 . 8 . 9 . 10 . 11 . 12 . 13 . 14 . . archivo 1 . 2 . 3 . 4 . . Halcrow 1 . 2 . 3 . 4 . 5 . 6 . . frentehalino 1 . 2 . 3 . 4 . 5 . 6 . 7 . 8 . . emicampanaoculto 1 . 2 . 3 . 4 . 5 . 6 . 7 . . Costa del Plata 0 . 1 . 2 . 3 . 4 . 5 . 6 . . Costa del oro 1 . 2 . . IRSA 1 . 2 . 3 . 4 . . flujos . . segmentos . . pendientes 1 . 2 . 3 . 4 . 5 . 6 . 7 . . delta 1 . 2 . 3 . 4 . 5 . . propuesta . 1 . 2 . . correconvectivo 1 . 2 . 3 . 4 . 5 . 6 . 7 . . plataforma 1 . 2 . . termodinamica 1 . 2 . 3 . . Sagoff . . ABL 1 . 2 . . congreso . . girh . . Acumar 1 . 2 . 3 . 4 . . evaluacion 1 . 2 . . BocaRiachuelo 1 . 2 . 3 . 4 . 5 . 6 . 7 . 8 . 9 . 10 . 11 . 12 . 13 . 14 . 15 . 16 . 17 . 18 . 19 . 20 . . StoDomingo . . urgenciasatadas 1 . 2 . . inundabaires 1 . 2 . 3 . 4 . . sinsustento 1 . 2 . . emisarios 1 . 2 . 3 . 4 . 5 . 6 . 7 . 8 . 9 . 10 . . UAG 1 . 2 . 3 . 4 . . áreas nuevas 1 . 2 . 3 . . acreencias 1 . 2 . 3 . 4 . 5 . . audiencia 1 . 2 . 3 . 4 . 5 . 6 . 7 . 8 . 9 . 10 . . Valls 1 . 2 . . contrastes 1 . 2 . 3 . 4 . 5 . 6 . 7 . 8 . 9 . 10 . 11 . . convexterna . . playas 1 . 2 . 3 . 4 . 5 . 6 . 7 . 8 . 9 . . Plan Maestro 1 . 2 . 3 . . Parque Norte . 1 . 2 . . ribera . 1 . 2 . 3 . 4 . 5 . . jurisdiccion 1 . 2 . 3 . 4 . 5 . 6 . 7 . 8 . 9 . 10 . 11 . 12 . . CSJNpisamr 1 . 2 . 3 . 4 . 5 . 6 . 7 . . zonas muertas . . Bermejo 1 . 2 . . Pilcomayo . . Uruguay 1 . 2 . 3 . . Paraná . 1 . 2 . . Asunción 1 . 2 . 3 . . Areco 1 . 2 . 3 . 4 . . Salado . . Samborombon . . Atalaya 1 . 2 . 3 . 4 . 5 . 6 . 7 . 8 . . PuntaPiedras . . Tuyú . . PuntaRasa 1 . 2 . . PuntaMedanos . . Mar Chiquita 1 . 2 . 3 . 4 . 5 . 6 . 7 . . Mar del Plata 1 . 2 . 3 . 4 . 5 . . Necochea . . Colonia . . MartinGarcia 1 . 2 . 3 . . montesdelplata . . botnia . . Puertos 1 . 2 . 3 . . formula1 . . disocio 1 . 2 . . senderos . . bajantes . . oceano 1 . 2 . 3 . 4 . . fitoplancton . . diatomeas . . hidrolinea 1 . 2 . 3 . . sustentable. 1 . 2 . . agua 1 . 2 . 3 . . hielo1300 . . antarticflows . . antarticmelts . . derrame . . luna 1 . 2 . 3 . 4 . 5 . 6 . . Trinidad . . prospectivas . 1 . 2 . 3 . 4 . . SantaCruz . 1 . 2 . 3 . . volcanes . . ley particular . . baires2060 . . aereadores . . Guaire . . marpampeano 1 . 2 . 3 . 4 . 5 . 6 . 7 . 8 . . Tamesis . 1 . 2 . . viajesedextra . . arena . . hospedero . 1 . 2 . . yacireta . . canalmagdalena 1 . 2 . 3 . 4 . . Barranqueras . . floods . . Santa Fe . 1 . 2 . 3 . 4 . 5 . 6 . . Hidrovia . . invitación . . ribera . 1 . 2 . 3 . 4 . 5 . . olas . . index . Anyone who has surfed knows the sheer power of waves, some of which can reach tens of metres high. They seem large and formidable enough. But imagine waves many times bigger than these – some reaching a kilometre or more in height and perhaps hundreds of kilometres in length. Such monsters are not the stuff of science fiction but can be found lurking, far from view, way beneath the ocean surface. Though unseen, undersea waves play a vital role in the transport and distribution of marine sediments and nutrients. They also affect global warming and climate change – and have the wherewithal to overturn ocean oil and gas rigs. "Deep mixing caused by the internal waves breaking in water more than 500 metres deep is important to predict global ocean circulation, which occurs through density differences between water at the poles and equator," says environmental engineer Nicole Jones from the University of Western Australia. "If we don't understand how much internal waves contribute to the deep ocean mixing then we cannot model climate change accurately," explains Associate Professor Jones. She is participating in an international study of undersea waves off the coast of Tasmania, which is potentially a global hotspot for deep tidal mixing. To this end, she and her doctoral student Tamara Schlosser will spend most of this month on board a US research vessel, the Roger Revelle, working with fellow scientists from the Scripps Institution of Oceanography, the University of California in San Diego, Oregon State University and University of Alaska. As well as climate modelling, their research is likely to benefit fisheries managers. "Undersea waves are important for transporting deep nutrients, which are trapped in the dark, deep water, into the surface layers where there is enough light for phytoplankton to grow," Associate Professor Jones says. "This, in turn, influences the productivity of fisheries in the region." Not far from where the Sydney-to-Hobart yacht race runs every year, the team will study tidal waves generated off New Zealand's south coast that break on the Tasmanian continental shelf. Some of these waves are up to 240 kilometres long. Associate Professor Jones, who has conducted similar studies off Western Australia's North West Shelf, says much remains to be discovered about internal waves, which affect safety aspects of the oil and gas industry and ecosystem management. During their time at sea, the team will deploy moorings, process water samples and analyse data received from a raft of instruments. Ocean surface waves travel at the interface between heavy water and the light air. This represents a huge difference in density. "In the ocean, there is lighter water at the surface and heavier water close to the bottom," Associate Professor Jones says. "These density differences are due to both the temperature (warmer water is lighter) and the amount of salt in the water (saltier water is heavier)." Waves travel along these density differences in the ocean just as they travel at the surface. "But they have different properties as the density difference is much smaller," she notes. Scientists measure undersea waves by assessing the ocean temperature and salinity at different depths. "We can see a wave pass by as very cold water from the deep ocean travels up towards the surface and then back down again," she points out. Just as surface waves are created by disturbances of some kind – such as when a rock is thrown in a pond or when wind ruffles the ocean surface – undersea waves are produced by disturbances to various density layers. The surface tide pushing water up and down undersea mountains and slopes is an important factor in creating internal waves. "This type of internal wave is called an internal tide and its frequency matches that of the surface tide every 12 or 24 hours, depending on its location," Associate Professor Jones notes. Again, like surface waves, internal waves steepen when they travel into shallow water and break. Imagine, for example, a surface wave breaking at the beach and pushing water up the sand. An internal wave undergoes a similar process but, as it occurs in much deeper water, the effects cannot be observed at the surface – only close to the seafloor. The strong currents and turbulence created by breaking internal waves can impose huge forces on seabed structures. "So, it's important to understand internal waves to ensure that structures such as oil and gas pipelines are designed appropriately," she explains. One could be forgiven for assuming that undersea waves are somehow related to tsunamis. They are not, scientists insist. "Undersea waves don't have anything to do with tsunamis," assures SydneyUniversity geoscientist Tom Hubble. "But they have tossed large submarines around like they were toys and gone close to causing a few oil rigs to collapse in the past." Queensland University of Technology earth scientist Patrick Hayman agrees. "Internal waves are unrelated to surface waves such as tsunamis," Dr Hayman explains. "Tsunamis are triggered by the displacement of water, which occurs when there is an earthquake and ground is shifted – or if a landslide or large-volume volcanic eruption enters the water." Most tsunamis are caused by large and powerful earthquakes like these that occur near the boundaries of tectonic plates. But some result from underwater volcanoes or landslides triggered by earthquake-related ground-shake. Tsunamis, sometimes incorrectly labelled tidal waves, are not just big waves. "It's probably better to think of them as a flooding surge of water rather than a breaking wave of wind-generated ocean swell," Professor Hubble explains. "The earthquake motion that generates a tsunami usually drives a sudden vertical movement of the sea-floor which displaces a large volume of the ocean." This, he says, creates a set of individual waves with great distances between their crests. The waves are not very high in the middle of the ocean, where they generally originate. In fact, as waves ripple outwards from an undersea quake or volcano, they are barely noticeable. But once tsunamis arrive in shallower waters, they race towards the shoreline, causing the whole ocean to rise up. This produces a surging flood of seawater over the seaside land. "Then the ocean rushes out seawards and can completely expose the near-shore coastal sea-floor, leaving stranded fish flapping about," Professor Hubble says. "Sometimes the first sign of an incoming tsunami is actually this unusual recession of the sea – then the surge rushes in, commonly with disastrous consequences." Sometimes the surge has enough momentum to travel uphill. There are reports aplenty of curious folk who ventured down to investigate a suddenly exposed seafloor, or to pick up stranded fish, getting caught up and drowned by the ensuing surge. "If the sea rushes out like that then the best thing to do is to get to high ground as quickly as possible," Professor Hubble warns. In Australia, the most vulnerable region is the north-west coast. This, says Professor Hubble, is because it directly faces the area of intense earthquakes south of the Indonesian archipelago. The east coast is also susceptible to tsunamis from subduction zones, where the edge of one crustal plate is forced below another. Due to the relatively shallow waters of the Bass Strait, tsunamis coming from subduction zones are unlikely to impact in a major way. Yet tsunamis entering Victorian waters might pose marine threats – such as potentially dangerous waves, strong ocean currents and the possibility of some localised overflow on to the immediate foreshore. The Australian plate is moving about 70 millimetres per year in a north-easterly direction. Indonesia and much of South-East Asia sit on the Sunda plate, which is moving easterly at about 20 millimetres per year. This collision of the Australian and Sunda tectonic plates causes the old marine crust on the Australian plate to dive under the Sunda plate. As the Australian plate moves northwards, the Sunda plate grabs the Australian plate and is dragged down with the subducting marine crust. When the stresses are greater than the crust can hold, the crust breaks, releasing seismic waves in the form of an earthquake. In subduction zones, the over-riding plate usually moves upwards and thus causes a tsunami. Two kinds of waves are visible in the image above, yet neither is the kind you are probably familiar with. 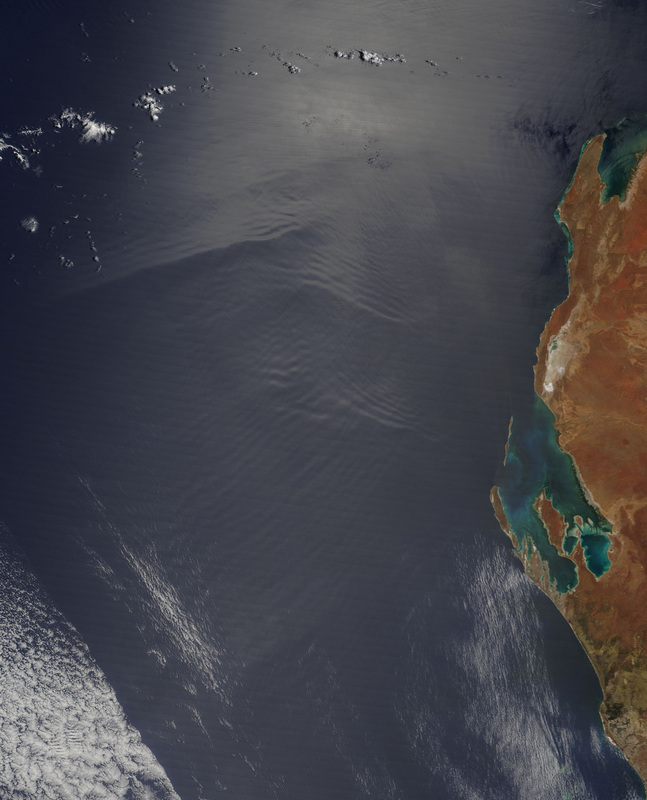 At 11:05 a.m. local time (03:05 Universal Time) on February 10, 2016, the Moderate Resolution Imaging Spectroradiometer(MODIS) on NASA’s Terra satellite acquired this natural-color image of wave patterns off the coast of Western Australia. Well offshore to the north and west, atmospheric waves are made visible by parallel bands of white clouds. Closer to the coast, the bright area of water is sunglint—the reflection of sunlight directly back toward the satellite imager. That sunglint makes it possible to see the faint ripples of internal waves; that is, large waves that propagate below the water surface, within the depths of the sea. Waves form in the atmosphere for a variety of reasons. Sometimes the movement of an air mass over a bumpy feature—a mountain ridge, a volcano, or an island amidst a flat sea—will force air to rise or sink, creating ripples in the sky like those propagating across the surface of a pond. Other times, the collision of different air masses will cause a rippling effect. It is unclear what caused the atmospheric waves in the image above. Off the west coast of Africa, we often see waves form when the dry air from the Sahara moves out over the much moister air over the tropical Atlantic Ocean. The dry air tends to push the moist air higher in the atmosphere, causing water vapor to form droplets and amass into clouds. The moist air rises, then gravity pulls it back down; the warm air rises again, then falls again. A series of cloud ripples mark the edges of the wave front as it propagates and dissipates. It is also possible—though perhaps less likely because of the distance—that the wave patterns in the image above have their origin inland. Western Australia is mostly desert and relatively flat, so it is possible that an atmospheric wave pattern formed when an air mass rode up over the Hamersley Range (just outside the scene) and out toward the sea. Internal waves are quirky phenomena that were scarcely known to science until the satellite era. They can be hundreds of meters tall and tens to hundreds of kilometers long. 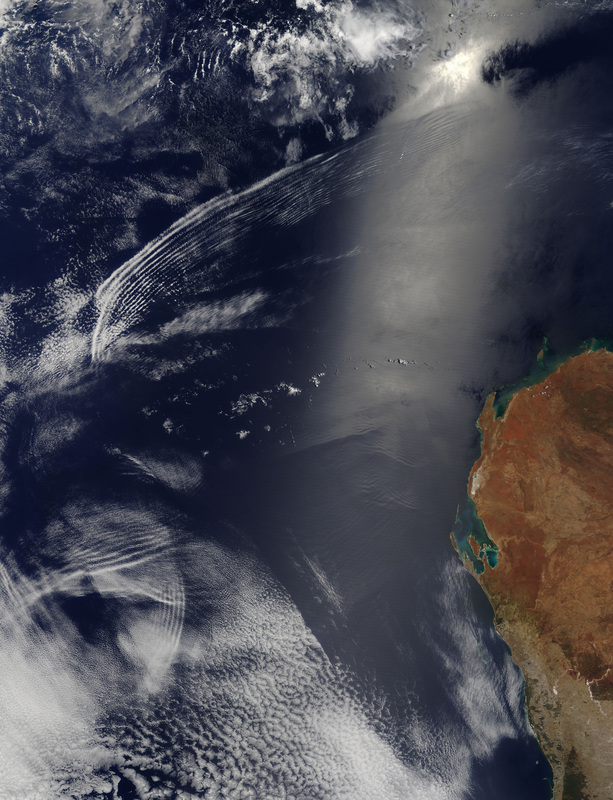 Enhanced by sunglint in the image above, these long wave forms moving across the sea surface are a visible manifestation of slow waves moving tens to hundreds of meters beneath the sea surface. Internal waves form because the ocean is layered. Deep water is cold, dense, and salty, while shallower water is relatively warmer, lighter, and fresher. The differences in density and salinity cause layers of the ocean to behave like different fluids. When tides, currents, and other large-scale effects of Earth’s rotation and gravity drag water masses over some seafloor formations, it creates wave actions within the sea that are similar to those happening in the atmosphere. If you were on a boat, you would not necessarily see or feel internal waves because they are not expressed at the surface in different wave heights. Instead, they show up as smoother and rougher water surfaces that are visible from airplanes and satellites. As internal waves move through the deep ocean, the lighter water above flows up and down the crests and troughs. Surface water bunches up over the troughs and stretches over the crests, creating alternating lines of calm water at the crests and rough water at the troughs. Calm, smooth waters reflect more light directly back to the satellite, resulting in a bright, pale stripe along the length of the internal wave. The rough waters in the trough scatter light in all directions, forming a dark line. “There are definitely ocean internal waves in this image,” said environmental engineer Nicole Jones of The University of Western Australia. “We have measured them off the coast of Ningaloo with instruments in the water. The different directions of the wave fronts are most likely due to the different seafloor slope directions in this region.” She notes that internal waves play an important role in global ocean circulation and mixing, which is critical to understanding the ocean’s role in climate and in the movement of nutrients and carbon from the depths to the surface and back. Jones and colleagues also study internal waves for their potential impact on drill rigs and other offshore structures. The Age (2015, February 9) Making monster waves beneath the surface. Accessed February 16, 2016. Scripps Institution of Oceanograpy (2015, January 8) International Team will Scrutinize the Ocean’s Skyscraper-High Internal Waves off Australia. Accessed February 16, 2016. NASA Earth Observatory (2007, October 20) Wave Clouds Off West Africa. NASA Earth Observatory (2013 February 4) Internal Waves off Northern Trinidad. 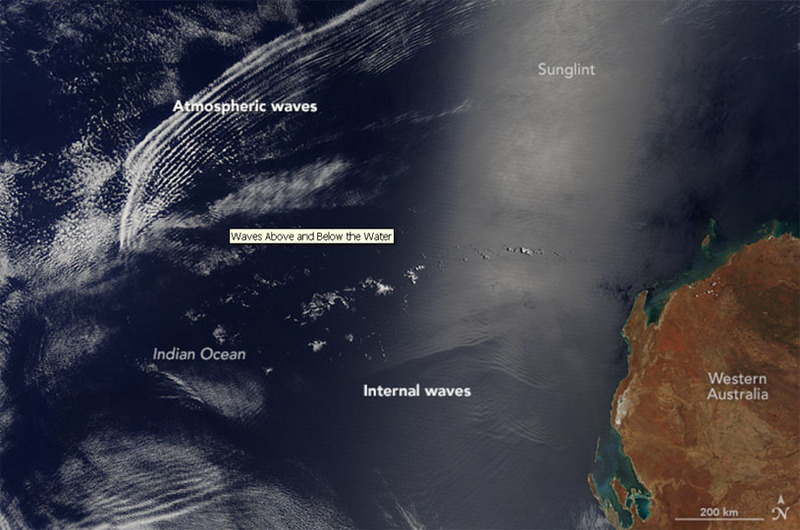 NASA Earth Observatory (2010, July 10) Internal Waves in the Indian Ocean.